Along with possible college credit, our internship program allows interns to gain a real-world experience in the nonprofit sector and gain hands-on experience in a wide-range of fields. This is also an opportunity to strengthening existing skills while accumulating new ones. Participants ages 18 and over are sure to expand their social network and establish relationships with professionals. Assist Managing Director with reaching yearly goals. Be available for weekly think-tank meeting. This meeting may also be a conference call. Participate in program planning along with researching and collecting data for grants. Assist with the prepping and planning of two community gardens. Be flexible and a self-starter, comfortable with minimum direction. Assist with the planning and implementation of age relevant educational, hands-on programs and activities around topics of wellness & nutrition education, urban gardening, eco-art, climate resiliency, and renewable energy (solar, wind, pedal bike, battery packs). 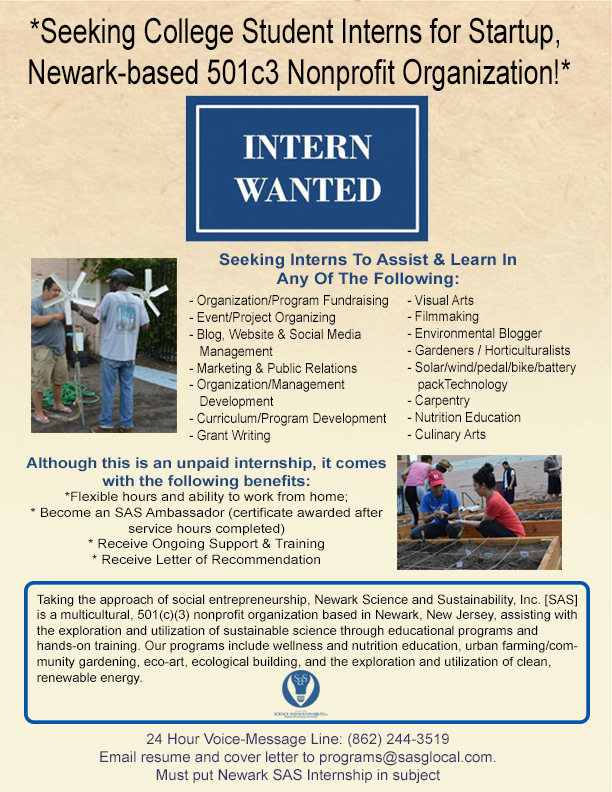 Assist with the organizing of small to large groups around issues related to urban agriculture, climate resiliency, nutrition, and the use of renewable energy. Assist with the use of documentary-style filmmaking and social media to share stories around wellness & nutrition education, community gardening, climate resiliency, and the use of renewable energy. Initiate and maintain respectful and mutually supportive relationships with residents, elected officials, local business owners, and other community stakeholders. Commit to a minimum of 20 hours per week. This includes community meetings, webinars, attending events, etc.